I paid $1 for this record. This is one of those records I've had for a long time but have never listened to. I picked it up on a whim from Amoeba Records' bargain bin, probably when I was living in the Bay Area. The thing that is awesome about bargain bin records is that you can buy something just based off of "Oh, I've heard that name before." It's a cheap gamble. On this particular roll of the dice, I landed on some pretty standard mid-90's fuzziness. Arcwelder add some interesting rhythmic twists to the formula of multiple guitar effects. I guess this might be post-grunge as it has that dark feel to it, but isn't nearly as sludgy. This is probably due to the little hint of twang in the vocals instead of screaming. There's an undercurrent of weirdness in this band. Not quite a Primus weird, but that same 90's pushing the boundaries for pushing the boundaries' sake. Not really revolutionary musically, but out there. Maybe nearer to the style of Faith No More, particularly on the B-side. On the back is a cover of Volcano Suns' White Elephant. That song is a decidedly weird mid-80's not quite new wave thing. 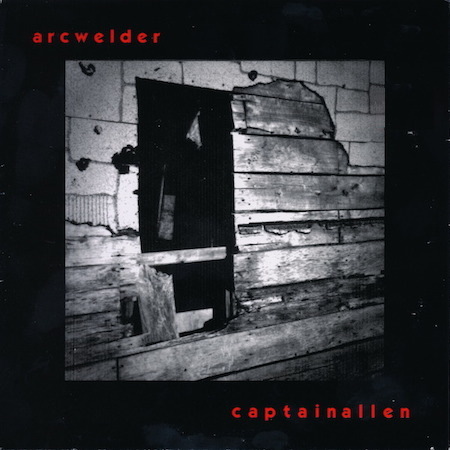 Arcwelder add a bit more fuzz to the mix, but otherwise sound pretty much the same as the original, including the Jello Biafra vocal affectation and almost feeding back guitar tone. Weird.